Once the disgust and anger quells somewhat, all that’s left is a sick sadness. Honor Killings, the phrase could be an oxymoron except that for so many people it makes too much sense. For too many people the effects of puberty– something as natural as a girl looking at a boy– is a crime. Anusha was fifteen years old, and that’s all she did, she looked at a boy. Let us suppose she did a lot more than just look: would any act justify your parents pouring acid on you and then leaving you to die in agony. The father now says it was the mother’s idea. I lost my rose colored glasses about women, and heaven being beneath mothers’ feet and all that jazz, after my stint at, of all places, the National Organization for Women where I wrotea paper on female genital mutilation. There are decent women/mothers; there are as many decent men/fathers. Unfortunately for Anusha neither parent came through. No doubt her parents think they did this out of love in order to safeguard her ‘reputation’. Are these parents aware of how screwed up their morals and ethics are? For fifteen years this daughter was with you: what sort of sick parents are you? Please, don’t tell me looking at a boy is a ‘western’ concept and allegiance to some code of ‘keeping the hymen intact’ is more important than anything else in the world. The father is a laborer, the mother is also illiterate: illiteracy and poverty are no defense for honor killing. How I detest this phrase: killing for honor. Killing a woman is no big deal for some– I get it. One day it will change. It has got to change. But by that day it will be too late for so many. Let’s see what the law does with this one. Hopefully it will deter future acid attacks but that does not mean that honor killings cannot continue by other means. Sharmeen Obaid Chinoy made an Oscar winning documentary on acid burning in Pakistan ‘Saving Face.‘ I wish ‘Saving Face’ had mentioned Fakhra Younas’ story in some way. For so many women of my generation, and no doubt many more generations, Fakhra Younas’ tale is one of nightmares. Fakhra was a dancing girl who attracted the eye of wealthy and influential Billal Khar. 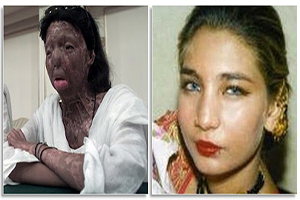 Billal married her: unfortunately he also severely disfigured her in an acid attack. Fakhra was helped by many, especially the Italian government, but her story ends unhappily. Fakhra was only 33 when she killed herself. When I first heard about Fakhra, I was a very young, very vulnerable girl. I do not want to belittle Fakhra’s life by saying something as droll as her plight ‘informed ‘ my life of relative privilege, but it did. It informed my life and played a huge role in making me who I am. I could have been Fakhra. Which was a very contentious statement back then because Fakhra was a ‘dancing girl’ and apparently somehow that justified her attack, whereas I came from a respectable family. I wish people sitting on their high horses about their respectable families would realize that that they could have just as easily been born ‘dancing girls’. Fakhra Younas will always have more face then many people with their self-righteousness will ever have. Will someone please acquire English rights to her memoir and translate it.